Prevent mxODBC Connect Server from listening on sockets which are unbound due to a configuration error. The OS will typically assign a random port and listen on all interfaces, which can pose a security issue. Add allow_clients configuration variable to [Session] config section of the mxODBC Connect Server. This allows overriding the list accepted client IP addresses/networks and helps to e.g. allow connections from clients not on the server's interface networks. Added "connections" shortcut support for allow_clients to easily access the list of configured networks defined by the connection sections. Added "all" and "localhost" shortcuts support for allow_clients to simplify allowing any client IP address or only the local machine. Updated included OpenSSL libraries to 1.0.1p. Please see the egenix-pyopenssl change log for a complete list of changes. Among other security fixes, this addresses the Logjam attack. Added support for the BinaryNull work-around added to mxODBC 3.3.5 in order to better support VARBINARY columns in MS SQL Server. Both mxODBC Connect Client and Server will need to upgraded to version 2.1.4 in order to be able to use the new singleton. The mxODBC Connect Client can now be compiled to a wheel file to simplify deployment. Simply point the pip at the prebuilt archive. Upgraded the mxODBC Connect Server to mxODBC 3.3.5. Documented and recommended use of SET NOCOUNT ON for running multiple statements or stored procedures. This can not only resolve issues with error reporting, it also results in better performance. Added a work-around for MS SQL Server Native Client to be able to support VARCHAR/VARBINARY(MAX) columns when using the Native Client with direct execution mode or Python type binding mode. Thanks to ZeOmega for reporting this. Added new helper singleton BinaryNull to allow binding a NULL to a VARBINARY column with SQL Server in direct execution mode or Python type binding mode (as used for FreeTDS). Using the usual None doesn't work in those cases, since SQL Server does not accept a VARCHAR data type as input for VARBINARY, except by using an explicit "CAST(? AS VARBINARY)". mxODBC binds None as VARCHAR for best compatibility, when not getting any type hints from the ODBC driver. Added a fix for the MS SQL Server Native Client error "[Microsoft][ODBC Driver 11 for SQL Server][SQL Server]The data types varchar and text are incompatible in the equal to operator." when trying to bind a string of more than 256 bytes to a VARCHAR column while using cursor.executedirect(). cursor.execute() was unaffected by this. Thanks to Paul Perez for reporting this. Added a note to avoid using "execute " when calling stored procedures with MS SQL Server. This can result in '[Microsoft][SQL Native Client]Invalid Descriptor Index' errors. Simply dropping the "execute " will have the error go away. Added a work-around to address the FreeTDS driver error '[FreeTDS][SQL Server]The data types varbinary and image are incompatible in the equal to operator.' when trying to bind binary strings longer than 256 bytes to a VARBINARY column. This problem does not occur with the MS SQL Server Native Client. Reenabled returning cursor.rowcount for FreeTDS >= 0.91. In previous versions, FreeTDS could return wrong data for .rowcount when using SELECTs.This should make SQLAlchemy users happy again. Add work-around to have FreeTDS ODBC driver accept binary data in strings as input for VARBINARY columns. A side effect of this is that FreeTDS will now also accept binary data in VARCHAR columns. Added work-arounds and improvements for Sybase ASE ODBC drivers to enable working with BINARY and VARBINARY columns. Added a work-around for a cursor.rowcount problem with Sybase ASE's ODBC driver on 64-bit platforms. It sometimes returns 4294967295 instead of -1. Added note about random segfault problems with the Sybase ASE 15.7 ODBC driver on Windows. Unfortunately, there's nothing much we can do about this, other than recommend using the Sybase ASE 15.5 ODBC driver version which does not have these stability problems. Added improved documentation on the direct execution model available in mxODBC. This can help in more complex parameter binding situations and also provides performance boosts for a few databases, including e.g. MS SQL Server. Updated included OpenSSL libraries to 1.0.1m. See ​https://www.openssl.org/news/secadv_20150319.txt for a complete list of changes. Among other security fixes, this addresses the FREAK Attack (CVE-2015-0204). Upgraded default RSA key length for demo certificates to 2048 bits. Upgraded eGenix PyRun used for mxODBC Connect Server on Linux to 2.1.0. 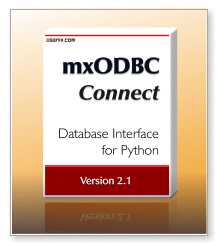 Upgraded the Python version used for mxODBC Connect Server to 2.7.9. Resolved an intermittent error related to hash seeds which sometimes caused prebuilt archives to not install correctly. Thanks to Albert-Jan Roskam for reporting this. Upgraded the mxODBC Connect Server to mxODBC 3.3.2. Fixed an "ODBC driver sent negative string size" error when using empty strings or None with output parameters for SQL Server ODBC drivers. Clarified that due to the way the SQL Server ODBC driver sends data, mixing output parameters and output result sets is not possible. A work-around for this is to send back output parameters as additional result set. Added a work-around for the Sybase ASE ODBC driver which has problems with BIGINT columns. These are now supported. Fixed a possible "ODBC driver sent negative string size" error when using empty strings or None with output parameters for Sybase ASE ODBC drivers. Fixed the handling of None as default value for output parameters in e.g. stored procedures to use VARCHAR binding rather than CHAR binding. The latter caused padding with some database backends. Changed cursor.colcount to be determined on-demand rather than right after the prepare step of statement execution. OpenSSL cipher string list updated to explicitly disallow use of low security or export ciphers. Fixed a problem that could cause the mxODBC Connect Client to not install correctly with pip. Fixed the package version number to show the correct release version. Fixed OpenSSL warnings in the Unix installer and scripts. In this patch level release we have put great emphasis on enhancing the TLS/SSL setup of the mxODBC Connect product, addressing recent attacks on SSLv3 and improving the security defaults. Updated included eGenix pyOpenSSL to 0.13.6, which includes OpenSSL 1.0.1j and enables the TLS_FALLBACK_SCSV protection against protocol downgrade attacks. OpenSSL cipher string list updated to use the best available ciphers in OpenSSL 1.0.1j per default and support perfect forward security. OpenSSL context options setup to disallow weak protocol features. Disabled SSLv3 for the mxODBC Connect Client in response to the recent POODLE attack on SSLv3. mxODBC Connect Client 2.1.1 will not be able to communicate with mxODBC Connect Server 2.1.0 and earlier when using SSL mode. The error message looks like this: [Error] [('SSL routines', 'SSL23_GET_SERVER_HELLO', 'unsupported protocol')] (using pyOpenSSL) or [SSLError] [Errno 1] _ssl.c:493: error:1408F10B:SSL routines:SSL3_GET_RECORD:wrong version number (using the ssl module). Enabled TLS v1, v1.1 and v1.2 for the mxODBC Connect Server in SSL mode and have it use the best possible protocol when talking to a client. The server will still support SSLv3 for backwards compatibility reasons, since older mxODBC Connect Clients only support SSLv3. This will be changed in the next major/minor mxODBC Connect Server release. Fixed a linker setting on Linux to have the mxODBC Connect Server use the embedded OpenSSL libraries instead of the system ones. Improved the protocol handlers for SSL connection setups using mixed plain text/TLS connections to renew the session id after having established the TLS session. Fixed a problem where connection/cursor.messages could not be accessed from the client side. Upgraded eGenix PyRun used for mxODBC Connect Server on Linux to 2.0.1. Upgraded the Python version used for mxODBC Connect Server on Windows to 2.7.8. Fixed a problem which prevented the mxODBC Connect Client to connect to the server when using both gevent integration and the Python ssl module for communication. Upgraded the mxODBC Connect Server to mxODBC 3.3.1. Documented a solution for a problem with the SQL Server 2012 parser complaining about not being able to deduce types of some operations using more than one bound variable, e.g. "col1 >= ? + ?". Improved the Teradata ODBC driver setup instructions to address some common gotchas when setting up mxODBC to work with these drivers. Fixed a problem with Teradata and the test suite which resulted in an error "[Teradata][ODBC Teradata Driver] Beyond SQL_ACTIVE_STATEMENTS limit". The driver needs an explicit call to cursor.flush() to close any open result sets before running commits or rollbacks. Fixed a problem in cursor.getcolattributes() that caused errors to be ignored. Added better protection against ODBC driver bugs in getenvattr(). Fixed an attribute error when using the NamespaceRowFactory function. Fixed a deprecation warning when using the NamespaceRowFactory function. The complete list of changes in mxODBC 3.3.1 is available on the mxODBC changelog page. mxODBC Connect 2.1 makes most of the new mxODBC 3.3. APIs and enhancements available in the mxODBC Connect Client. This is a short summary of the available new features and enhancements. mxODBC Connect now has full support for input, output and input/output parameters in stored procedures and stored functions, allowing easy integration with existing databases systems. Added support for user customizable row objects by adding cursor/connection .rowfactory and .row constructor attributes. When set, these are used to wrap the normal row tuples returned by the .fetch*() methods into dynamically created row objects. Added new RowFactory classes to support cursor.rowfactory and cursor.row. These allow dynamically creating row classes that provide sequence as well as mapping and attribute access to row fields - similar to what namedtuples implements, but more efficient and specific to result sets. Switched to forward-only cursor types for all database backends, since this provides a much better performance for MS SQL Server and IBM DB2 drivers. Added a new .cursortype attribute to allow adjusting and inspecting the ODBC cursor type to be used for an mxODBC Connect cursor object. Default is to use forward-only cursors, but mxODBC also support several other useful cursor types such as static cursors with full support for result set scrolling. Enhanced cursor.prepare() to allow querying cursor.description right after the prepare step and not only after calling a cursor.execute*() method. Added iterator/generator support to .executemany(). The parameters list can now be an iterator/generator, if needed. Added new connection.dbapi property to easily access module level symbols from the connection object. Timestamp seconds fraction resolution is now determined from the scale of a datetime/timestamp SQL column, using the connection.timestampresolution as lower bound, when using SQL type binding. In Python type binding mode, the connection.timestampresolution determines the scale with which a variable is bound. This allows for greater flexibility when dealing with database backends that don't provide full nano-second second resolution, such as e.g. MS SQL Server. mxODBC Connect now accepts Unicode string values for date/time/datetime/timestamp column types in SQL type binding mode. Previous versions already did in Python type binding mode. mxODBC Connect now uses unicode(obj, encoding) semantics when binding Python objects to SQLWCHAR database parameters. Additionally, it ignores the encoding in case obj is a number, to avoid conversion errors. Added new cursor.encoding attribute. This gets its default values from the connection the cursor was created on and allows for per-cursor encoding settings. Added cursor.bindmethod which inherits from connection.bindmethod when creating the cursor. This allows adjusting the variable bind method on a per-cursor basis, rather than only on a per connection basis as in previous mxODBC Connect versions. The SQL lookup object is now cached on the client side to avoid frequent roundtrips when using symbols which are needed for stored procedures with input/output parameters. The SQL lookup object now supports ODBC 3.8 symbols and values, including driver specific symbols used by the MS SQL Server Native Client and IBM DB2 ODBC drivers. Improved the server side object management to simplify client side garbage collection considerations. Even though we still encourage using explicit garbage collection of cursors, connections and server sessions on the client side, mxODBC Connect Server will now handle most situations even without these explicit calls. Tested with the latest gevent and greenlet packages. mxODBC Connect Client will happily work together with the asynchronous libraries gevent. All it takes is a single configuration entry in the client side config file. Changed the way passwords are stored in the server's authorized-users.txt file in order to make password storage more secure. The file now stores salted SHA-256 password hashes instead of the MD5 hashes used in version 2.0 and earlier. User authentication now uses salted SHA-256 password hashes when transferring the login data from the client to the server. This provides better protection when using plain text client server setups and additional security over SSL network connections. mxODBC Connect Server is now built against unixODBC 2.3.2 on Linux. Updated the DataDirect binding to version 7.1.2 of the DataDirect ODBC manager on Linux. Added work-around for Oracle Instant Client to be able to use integer output parameters. Added a work-around for Oracle Instant Client to have it return output parameters based on the input placeholder Python parameter types. It would otherwise return all parameters as strings. Disabled a test for Oracle Instant Client which tries to set a pre-connect connection option for timeouts, since the ODBC driver segfaults with this option. mxODBC Connect Server now defaults to 100ns connection.timestampresolution for MS SQL Server 2008 and later, and 1ms resolution for MS SQL server 2005 and earlier. This simplifies interfacing to SQL Server timestamp columns by preventing occasional precision errors. Tested mxODBC Connect Server successfully with new MS SQL Server Native Client 11 for Linux. Unicode connection strings still don't work, but everything else does. Added documentation on how to use Kerberos with mxODBC and SQL Server for authentication on both Windows and Linux to the mxODBC User Manual. Added note about problems of the FreeTDS ODBC driver dealing with TIME and DATE columns to the to the mxODBC User Manual. Added work-around for the Sybase ASE ODBC driver, which doesn't always pass back NULL correctly to mxODBC Connect Server on 64-bit Unix systems. Changed the variable type binding mode default for the Sybase ASE ODBC driver from Python type binding to SQL type binding, which resolves issues with e.g. the Unicode support for that driver. Added note about a segfault problem with the Sybase ASE 15.7 ODBC driver which is caused by the driver corrupting the heap. Added work-around for the IBM DB2 ODBC driver, which doesn't always pass back NULL correctly to mxODBC Connect Server on 64-bit Unix systems. Added work-around to force Python type binding for the PostgreSQL ODBC drivers. More recent versions of the driver report supporting SQL type binding, but they don't implement it. Added work-around to have PostgreSQL ODBC drivers properly work with binary data for BYTEA columns. mxODBC Connect Server now supports native Unicode with the recent MySQL ODBC drivers - provided you use the Unicode variants of the drivers. Changed the default binding mode for MySQL ODBC drivers to Python type binding. This works around a problem with date/time values when talking to MySQL 5.6 servers. CVE-2014-0160 ("Heartbleed Bug"): A missing bounds check in the handling of the TLS heartbeat extension can be used to reveal up to 64kB of memory to a connected client or server. This issue did not affect versions of OpenSSL prior to 1.0.1. For information, also have a look at the Heartbeet Bug website. Upgraded client and server to the most recent eGenix pyOpenSSL Distribution 0.13.3.1.0.1.6. Authentication errors are now reported with the SYSTEM_ERROR log level, making them visible using the default server side log level setting. Updated the server to use eGenix mxODBC 3.2.3 for database connectivity. Added new server connection configuration setting connection_cursortype which allows modifying the default cursor type (connection.cursortype attribute value; see changelog entry for mxODBC Connect 2.0.3) without having to modify the client side applications. The setting can be applied on a per connection basis for enhanced flexibility. Added back the DataDirect ODBC manager subpackage which was missing in the 2.0.3 builds. The mxODBC DataDirect subpackage is now built against the current DataDirect ODBC manager version 7.1.2. Fixed the logging of allowed clients in the server.log to show the defined connection's subnets. Fixed a problem with the .warningformat attribute not working as expected on cursors and connections. The performance increase compared to mxODBC Connect 2.0.2 is enormous: from 2-3x faster executes/fetches for average queries, up to 300x faster for simple cases. In mxODBC Connect 2.1, we will switch to using forward-only cursors per default for all database backends. IBM DB2 can benefit from the same performance enhancements using forward-only cursors. The effect is a lot smaller, but still noticeable: up to 2x faster executes/fetches with forward-only cursors, compared to mxODBC Connect 2.0.2. Upgraded client and server to the most recent eGenix pyOpenSSL 0.13.1.1.0.1.5. Updated the server to use mxODBC 3.2.2 for database connectivity. Added support for the new .cursortype attribute in mxODBC 3.2.2 which is available on both connections and cursors to adjust the used ODBC cursor type. Added documentation to explain the different cursor types, compatibility with different database backends and effects on performance to the mxODBC documentation. Upgraded client and server to eGenix pyOpenSSL 0.13.0-1.0.1c. Added support for unlimited connection licenses. The server installer on Windows will now install the Microsoft Visual C++ 2008 SP1 Redistributable Package (if necessary) instead of shipping with side-by-side runtime DLLs. This resolves installation issues on fresh Windows server installations. Improved the active connection logging to show more accurate figures in situations where a lot of new connections are opened at once. mxODBC Connect Server will now free resources on broken connections much earlier than before. The setting is configurable using the max_session_reconnect_time parameter in the server's [Activity] configuration and defaults to 60 seconds. Added a note that even with an unlimited license, the server sill uses an adjustable max_session configuration parameter to limit the effect of denial-of-service attacks. Added support for returning SQL Server TIME columns as time value instead of as string. Added a work-around to prevent truncation warnings with the SQL Server ODBC driver when using .executemany(..., direct=1). Thanks for Michael Bayer. Upgraded the mxODBC used in the server to version mxODBC 3.2.1. Added egenix-mx-base dependency to mxODBC Connect egg files. Added hint on how to work with REF CURSORS in Oracle stored procedures. Thanks to Etienne Desgagné. mxODBC Connect Server is now also available as native 64-bit build for Windows 2008R2, Vista and 7 x64. All mxODBC Connect Server executables are now signed on Windows to reduce the number of UAC dialogs during installation and use. The mxODBC Connect tray app was rewritten in C to reduce the memory footprint. The mxODBC Connect Server tray application was updated to work on Windows 7 as well. mxODBC Connect now supports Python 2.7 both on the client and server side. mxODBC Connect Server now supports unixODBC 2.3 or later on Unix platforms. unixODBC 2.2 is no longer supported on 64-bit systems. mxODBC Connect Server now uses mxODBC 3.2 internally and makes its API available in the mxODBC Connect Client. This is a major step forward from the mxODBC 3.0 version used in mxODBC Connect Server 1.0.
mxODBC Connect Server now features all the ODBC driver compatibility enhancements provided by mxODBC 3.2, including better support for MS SQL Server Native Client, Oracle Instant Client, Sybase ASE, IBM DB2, Teradata and Netezza. See the included mxODBC 3.2 documentation for more details..
mxODBC Connect Client now integrates directly with gevent, allowing client applications to run asynchronous tasks while performing remote database queries. mxODBC Connect Client also works with a monkey-patched gevent environment. mxODBC Connect now uses the official IANA registered port 6632 (mxodbc-connect) for both plain text and SSL-encrypted communication. Added STARTTLS support to be able to use a single port for both unencrypted and SSL-encrypted communication. mxODBC Connect Client no longer requires a client certificate and key for SSL connections. mxODBC Connect Client now allows selecting the used SSL module from two available options: Python standard lib ssl module and pyOpenSSL. Upgraded to pyOpenSSL 0.13.0-1.0.0j on the server side. mxODBC Connect Server will now use SHA1 digests for client certificate checks instead of MD5 to improve security. mxODBC Connect Client can now additionally read client certificate and private key from the config_data dictionary instead of from files only - provided that pyOpenSSL is used (Python's ssl module doesn't support this). Client certificate checks are now also supported when using the standard Python ssl module on the client side. mxODBC Connect Server will now return ProtocolErrors to the client side and close the connection in case it finds that it cannot decode the client side pickle. Fixed a problem with database connections being kept alive in sessions that were not explicitly closed by the client application. mxODBC Connect pure Python prebuilt archives did not always install on non-Linux platforms. ServerSession.close() will no longer cause error messages at Python exit time, if the close action cannot be communicated to the server. mxODBC Connect Client will now raise a mx.ODBCConnect.Error.ConnectionFailureError in case of server connection failures due to timeouts. Fixed a bug in session.open() which caused the module_name parameter not to get used. Python 2.3 and 2.4 support was removed from mxODBC Connect Client. The start menu entry on Windows now includes a link to the correct ODBC manager to be used with mxODBC Connect Server. This helps finding the right one on Windows x64 platforms which provide two versions. mxODBC Connect Client will now directly install into the correct directories on Linux distributions that use different directories for platform dependent and non-dependent directories (e.g. 64-bit RedHat and 64-bit OpenSUSE), without needing additional options on the install command. Added backwards compatibility support for the old-style using_ssl way of configuring server connections. Fixed a problem with connections sometimes timing out after 10 seconds of inactivity. Connection errors now cause an implicit immediate close of the connection (without having to wait for a timeout). This allows the client to shutdown much faster when exiting the Python client application in the situation of a broken server connection. Clarified the INI file format used by mxODBC Connect Server and Client and added an extra section for this to the documentation. Added cursor iterator support to mxODBC Connect Client. Fixed a bug in print_resultset() due to a missing import in one of the modules. mxODBC Connect Client prebuilt archives failed to install on non-Linux platforms. mxODBC Connect Client's ServerSession.close() will no longer cause error messages at Python exit time, if the close event cannot be communicated to the server.